Pixel Press Floors is an iOS and Android game that allows you to make your own platformer levels. I Kickstarted this around June of 2013 because of an interesting hook: you actually design by hand on paper and take a photograph of the paper to import it into the game. There were a few hiccups, such as the Android version being significantly delayed. As an iOS user, this didn’t bother me. However, two others things did. First, the game changed from a paid game to a free game with in-app purchases. As someone who backed the game early, I got an account in the game that reflected this. Supposedly this would give me bonuses. I don’t know what those are. I thought I was supposed to be able to place enemies in my level (it’s normally an IAP), but I don’t see any option for that currently. [Update: I contacted the developer, and they fixed everything for me within a day. Great customer service!] The second, bigger problem is that the creation mode ended up being iPad only. That’s great if I owned an iPad, but I don’t. Regardless, I finally had a chance to sit down and make some levels with gem’s iPad, and it was a ton of fun. I’m still annoyed about not being able to create on the iPhone, and I’m hoping they add it. As for the backer bonuses, I don’t know what the deal is there, but I just reached out to Pixel Press to find out. As for making levels? Fun! You don’t get to change any of the physics or design your own sprites, but you still can set the layout of levels. Even though what initially piqued my interesting was designing on paper, I did the whole thing on the iPad. You can watch the video embedded above to see my level, appropriately named The Adventures of Peter. And hey, I published it around 1:30 today and it already has 77 plays! If you like platformers, you might want to give this a try. As mentioned, it’s free. There are a ton of community-created levels, and you can search for mine as well. 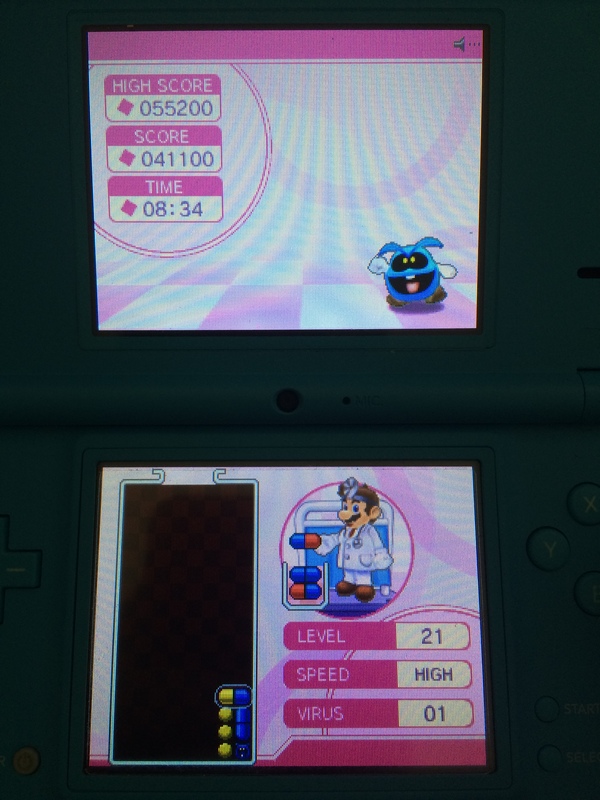 When I get down to the last virus in Dr. Mario Express, sometimes I like to keep trying to clear the extra pills so that I can fully clear the level. Usually there are leftover pieces. This is the first time I’ve managed to clear every last pill along with that pesky virus! Woo! Yes, I’m behind, but I started 2015 by beating Gears of War 3. I really enjoyed it! I suppose there are going to be some minor spoilers here, but I won’t spoil the big points. The opening of the game on the CNV Sovereign is cool because it’s nice to see the ship and Michaelson, leader of the COG Navy. He was a major character in the novels, but this was his first appearance in game. Unfortunately, I felt like major changes from the books were changed rapidly. Michaelson is only in the very beginning of the game, likely because people who didn’t read the books wouldn’t care about him. The former Chairman Prescott returns early in the game too with his MacGuffin. It makes sense from a story standpoint, and by the end of the game, it all makes sense, but it still feels weird. From there the game progresses well. There are more characters that follow Marcus, which makes it more varies and interesting. Anya, Sam, and Jace are all major characters now too. There are floating gas barges that are pretty cool, but at one point you’re forced into combat using one. Similarly, you later control the guns on a submarine. I don’t play Gears of War to do these things. I feel like these levels are the modern equivalent to the “obligatory mine cart” level. I’m not sure what to call them, but I don’t want to take control of some larger contraption with a totally different feel. Getting through some less-than-amazing parts get you to Anvil Gate, another major location from the novels, so I suppose it’s worth it. We also get to see Colonel Hoffman and Bernie, so that’s pretty cool too! Dom seems a little more reserved and depressed after the events of the second game, which makes for some interesting character development. He has a really amazing moment during the game. The Carmine in this game is a bit more badass too. The end of Gears of War 2 had gameplay that differed a bit from the main game. It felt anti-climatic regarding gameplay even if the story itself was quite climatic. This wasn’t a problem in Gears 3. The last battles felt really climatic and awesome, which is one of the most important things in a game besides actually being fun. Now I just have to resist the urge to spend money on Gears of War: Judgment until I beat some of the other games I own!